Most people come to Aysgarth because they want to visit those famous falls. The village, a bit further west of Aysgarth Falls doesn’t look at first as if it has much to offer the tourist – even if it does have some excellent accommodation and food available. 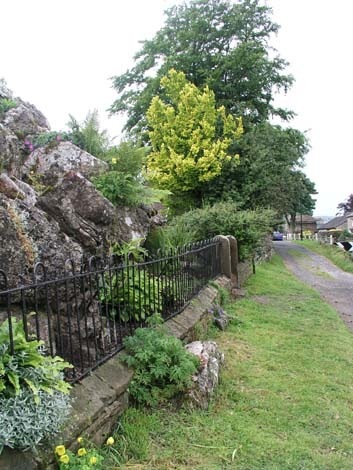 It does now have a beautifully maintained Edwardian rock garden at the west end. 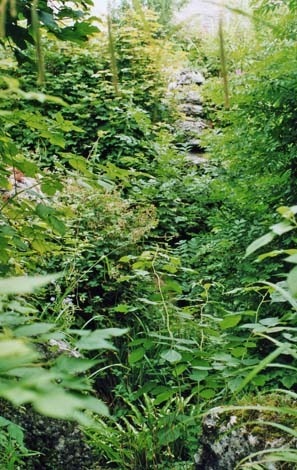 When I first came to the village it was almost impossible to move around in the rock garden as it was so full of brambles and nettles. Thankfully Peter and Angela Jauneika found sufficient funding to be able to restore it and it was opened to the public in April 2003. 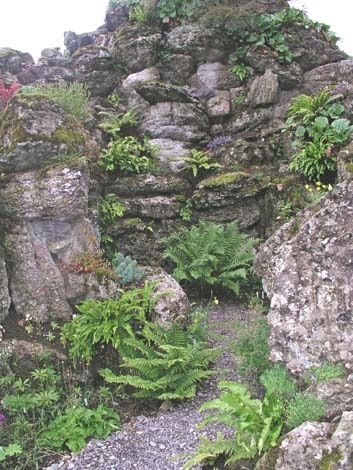 Below: The exterior of the rock garden in early 2002 and how it looked after restoration. And inside the garden before and after. From the gateway to the rock garden it is possible to look out across Wensleydale and down what is known locally as Jammy Hill. I have always been fascinated by the painting of James Thompson which hangs in the institute. It shows him at work as a cobbler and clog maker. His home overlooked the hill that now is remembered by his name. In 1891 there were two shoemakers in Aysgarth as well as a butcher, two grocery shops and a postmaster. The village could still boast a general store with post office and a cheese and wine shop at the end of the 1990s. But then we had what I called the “cheese and wine war” when the owner of the general store decided to go into competition with the shop next door. Not surprisingly that didn’t help either shop and within a few years both had closed. One has been replaced with an excellent teashop. Below – our cheese and wine wars in the summer of 1998. James Thompson lived next door to Frank Graham, the illegitimate son of a housekeeper, who had finally come into his inheritance from the Aysgarth landowner who had fathered him. It was Frank Sayer Graham who had the rock garden built as well as his Arts and Crafts inspired house opposite (Heather House). From Jammy Hill one drumlin (a hill created when the glaziers receded at the end of the Ice Age) stands out. The old Douglas Firs on top of it gave Lady Hill at very distinctive shape for many years. It will take time for the young Douglas Firs to be so misshapen. When Frank Graham owned Lady Hill it was an enclosed warren where he bred silver-grey rabbits. In the early 20th century he was still exporting the black furs from the young rabbits to Russia. He became a major benefactor of St Andrew’s church at Aysgarth in the first decades of the 20th century. 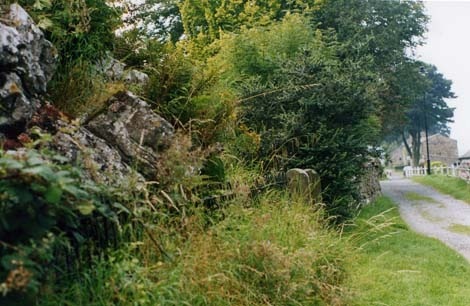 The Anglican church had remained a central feature of village life even though the Dale had witnessed the great spiritual revivals of the 17th Century when the Religious Society of Friends (Quakers) opened its first meeting houses and the 18th Century when many responded to John Wesley’s preaching and became Methodists. There are still two Quaker houses west of the rock garden and the Society of Friend’s burial yard behind them. As there are only a few gravestones at the south end the Wensleydale and Swaledale Monthly Meeting Trusts gave permission for the children of the village to play football in the burial yard.